Micha Boyett thought that she knew about faith and prayer. She grew up going to church and even worked as a youth leader. But after the birth of her son, she found that her carefully ordered prayer life had fallen to shambles. The early mornings that she had previously spent with her Bible and prayer were now filled with feeding and rocking a baby. How could she talk to God when her prayers were mostly pleas for help in between loads of laundry and picking up toys? Did God really want to hear from her anyway? Micha searches for inspiration in a fascinating place - among the teachings of Benedictine monks. She finds their time of quiet prayer compelling and realizes that their days mirror our own in many ways. Their days are broken into small sections, just like ours. So Micha begins to pray as they do - not all at once, but in small moments throughout her day. She prays when she wakes up and then later at the playground, while making dinner and before going to bed. Found identifies a problem for many of us - we were raised to admire and emulate people who did big things. We believed that God could call us to save orphans or tend to the sick. When we find ourselves in the midst of ordinary life, whether that is a 9 to 5 job or staying home with small children, we find ourselves unsure if God loves this life, if God can use us in these ordinary places. The heart of this story is Micha (and us) asking "can I believe the God loves the ordinary? That God loves the ordinary in me?" The defining aspect of this memoir is gentleness. Micha is learning to give herself grace and find a way to pray that works for her time and situation. In doing so, she gives us permission to do the same. Somehow this book about the everyday joys and sorrows of life is utterly engaging. Most of the time, a book needs a breakneck plot with a big mystery to keep us feverishly turning the pages. But this writing is slow and gentle while always compelling you to read just a bit more. This is not just a book for mothers - it's a book for anyone who finds themselves in an unexpected season of life, in a job they didn't want, or a city they didn't want to live in. It's for the ones who are sure of God's love and those who doubt. 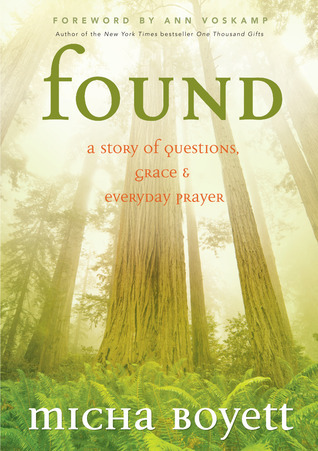 Found is for each one of us as we listen for the voice of God saying that we are enough. Nice review, thanks for sharing. Not sure I would read this, but I enjoyed your review. Sounds like a soothing book to read when stressed, especially young mothers. Thanks Rita. She does come from the perspective of a young mom, but I think it is applicable to so many people! This is perhaps one of the biggest struggles in my life. My dh and I were missionaries in Guatemala when he got sick. We came home to the US and he passed away with leukemia. Now I'm remarried and raising my 5 kids. But, wait a minute--aren't I supposed to be doing something bigger? No. I lost sight of what was really the biggest thing of all. Raising my kids. Sometimes we think the important things are unimportant. Heidi, I'm so honored that you shared that bit of your life with me, I had no idea you worked as a missionary! I think it's tough to see the big picture of parenting because so much of it is thankless and monotonous. Found sounds like a wonderful read to slow down in this fast-paced world of more where success is often defined materially and externally. It sounds like a tranquil book with a strong message. Thanks for sharing! Yes, it's a wonderful book and it really does help you to take a deep breath in the midst of all the craziness!